It's not often that a single fighter features on a poster but it appears that we've got a show that bucks the general trend of posters and does just feature a single fighter. 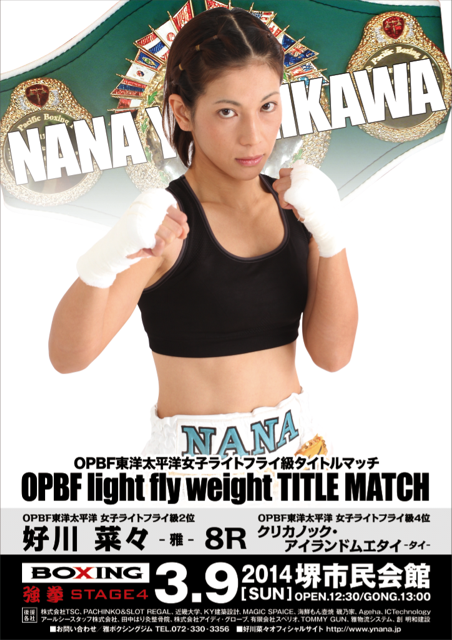 The fighter in question is former amateur standout Yoshikawa Nana who steps up massively on March 9th. The former amateur star looks to claim the OPBF Light Flyweight title as she fights Thailand's Krikanok Islandmuaythai in an excellent match up. Despite the quality of the match up the poster is weak with only Nana featuring on it. The show features 9 bouts though with Nana being the only fighter on the poster you'd struggle to know that there was actually full show here. A real shame.